As yachts grow larger, the norm is to run the air conditioning all of the time. This is the result of both high isolation, with scant attention paid to ventilation or insulation, and old habits. Once this becomes the MO, you are forced to go with a generator-based approach to power, assuming 24/7 operation thereof. Since you are totally dependent on the genset at anchor and at sea, you end up with two, and possibly a third night generator. If one of the two main gensets dies, then you are going to seek immediate repair, because if the second goes south life aboard will become less than pleasant. But if you reduce the heat load with shading, design in good insulation, and provide for efficient ventilation, a different approach is possible, one that offers a higher degree of reliability, and freedom of movement. When we started the Wicked FPB design cycle, this baseline systems decision was at the heart of the concept. Taking what we had learned from the solar array research for Wind Horse, and starting from scratch designing for solar generation, it was immediately apparent that we could go a long way towards reducing dependence on fossil fuel. Coupling solar output with a 2000 amp hour (C-10 rating) 24VDC house bank of traction batteries significantly extends the period between charge cycles. Since DC charging is a huge power consumer on the genset, the genset can be smaller. In favorable environments solar charging has the potential to drastically reduce or eliminate the charge cycle. As the engines each have a pair of 4kW Electrodyne alternators, and there are four 5000 Watt inverters, there is significant redundancy in charging capability and AC power supply underway and anchored requirements. A single genset can now provide power for environments requiring heavy air conditioning at anchor. Otherwise, in many scenarios the genset will see little use. Refrigeration systems stay in the same idiom as in the past: DC-based, heavily insulated custom boxes, with evaporators and compressors specified for maximum efficiency. Air conditioning loads are considerably lower due to shading, insulation, and ventilation, allowing use of super quiet direct expansion compact compressors. This is more reliable, takes less power, and provides a more pleasant ambiance (more on HVAC later). Lower air con loads mean we can still use fresh water cooling for heat exchange with small highly efficient (and quiet) pumps. Making the HVAC Cycle More Efficient. 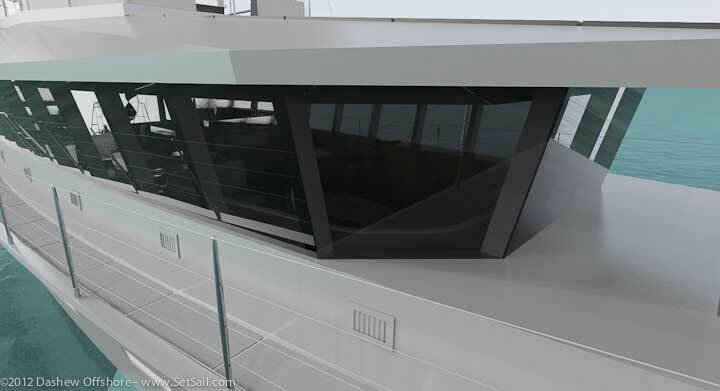 In temperate climate during the day and the topics at night, to the extent fresh air can be brought into the boat, air conditioning loads can be reduced and this requirement for an efficient fresh air supply system was one of the driving forces in this design. It starts with the coamings on which the house and Matrix deck structure sit. We’ve covered this topic in detail here, so we’ll just recap for now. 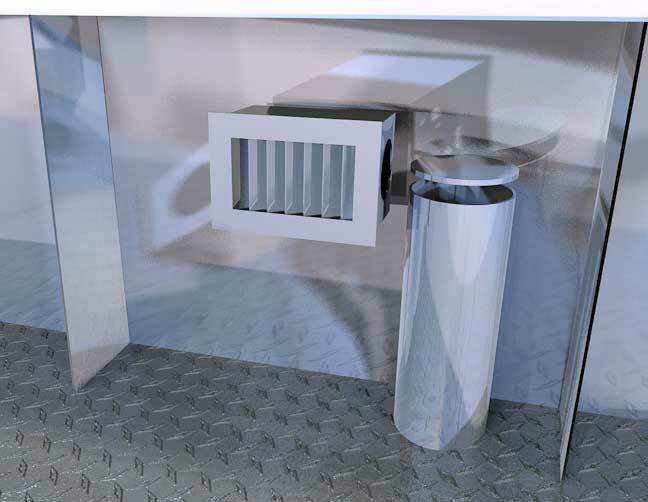 The coaming system is designed to be an integral part of the ventilation system. It starts with this substantial grill area forward of the house. 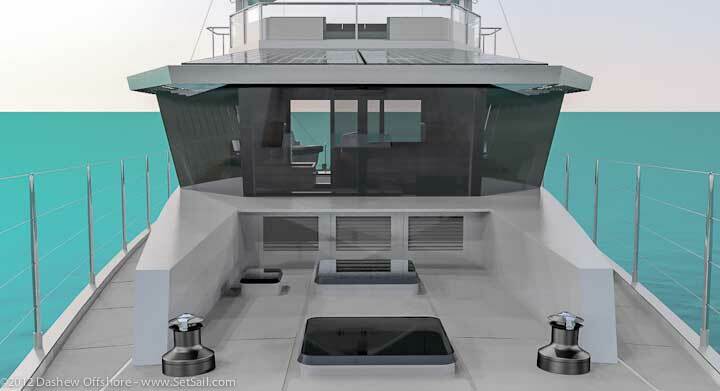 A combination of water-shedding grill design, and Dorade-style internal structure, make it possible to use this in a wide variety of sea states and rain where a hatch would need to be closed (there is an integrated storm cover for use at sea). This system is used to ventilate the great room. There are a pair of these powered vents, one pressurizing and the other extracting, for each below decks living area (four in the owner’s suite). They are almost silent (38dB) and take just a few Watts per fan per hour. The combination of these two sources of fresh air alone go a long way toward reducing air conditioning dependency. There is also a shading factor at work as well. Those outward tilted windows are literally cool. They reduce glare of course, and make the interior window covering system easier to use. They also act like built-in shade awnings, enhanced by substantial forward, aft, and side overhangs. 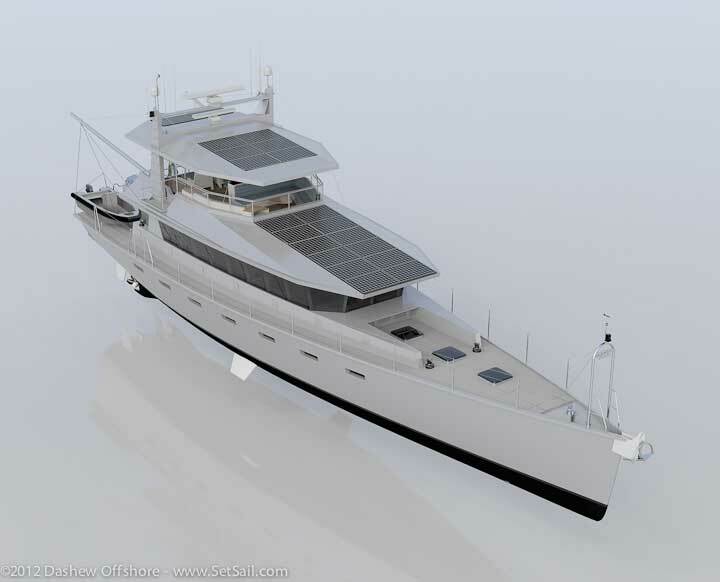 Solar arrays on yachts are more difficult in terms of optimum output than land-based arrays. You cannot easily orient the panels, nor avoid losses from shadowing. But if you couple 19% efficient solar panels with careful design, eye opening results can be achieved. This starts with having sufficient real estate on which to place the panels. Along with shading considerations, allowance for cooling must be made since panel output is related to temperature. As you will have noted, we have quite a few of these panels, twenty to be precise. The question is: what sort of output can we achieve in the real world? For information in this arena, we depend on long time friend and efficient energy guru, Bob Williams of SALT in Marathon, Florida. Bob has been installing these systems on land and sea for many years. The first thing to understand is that panel output varies with angle to the sun. The amount of variation in output is a function of panel type. Panels get hot, and the hotter they are, the lower the power output. So, ventilation is a factor. With the integrated solar design of the Wicked FPB, 75mm (three inches) has been allowed at the front of the lower array with 25mm (one inch) between panels. As ome installations on land often have 50mm/2″ or less and typically have panels butted to each other, we think we’ll be in good shape here. 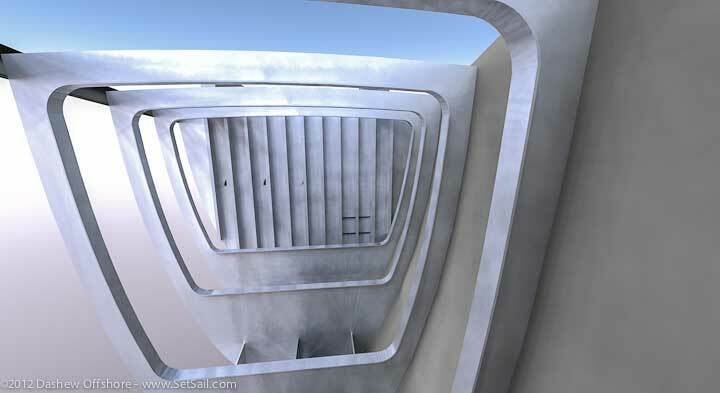 The upper deck has a minimum air gap of 50mm/2″. Of the eight upper panels, four are de-rated to 30% nominal output, and the other four to 85%. On the lower array, four are de-rated to 30% with the remaining eight at 85%. This adds up to .85 times 12 panels, times 320 Watts, or 3264 Watts per hour. And .3 times eight panels, times 320 Watts for an additional 768 Watts per hour. Total output equals 4032 Watts per hour. The next step is to determine how many solar hours of energy can be expected. Obviously this varies with cloud cover, panel orientation, and the angle to the sun. For our purposes we look at a wide range of possible outcomes. Cruising in higher latitudes, with longer days during the summer months, means longer periods of solar power, reduced only by weather. In the tropics, you often cruise in the winter months, so solar hours are shorter. Our best guess, and there are too many variables to be completely certain of the numbers, is that there’s a good chance the Wicked FPB system will experience between five and seven solar hours per day. To convert this to usable energy we multiply the solar hours times the total array rating per hour, or 4032 x 5 for 20,160 Watts, or times 7 for 28,504 Watts. Assuming half the solar array output is used to offset power consumption during the day, and the other half is used to replenish power consumed from the batteries at night, we divide by the charging voltage, and the nominal battery bank resting voltage to get DC amps. So, for the lower output the calculation would be 20,160/2/25 (resting voltage) and divided by 27.8 (charging voltage, this being a 24V DC battery bank). So, 403 amps +362 amps for 765 amps in areas where the five hour solar day prevails. Where there is better sun power, say the seven hours, this figure would rise to 1063 amps. These numbers sound awfully good! So let’s add a fudge factor and de-rate another ten percent. This drops the output available to between 688 amps and 956 amps per day. Putting this into context, in the worst case it would easily cover all the DC requirements on the FPB 83, Wind Horse. The Wicked FPB will use more power due to her greater size. Still, with a modest degree of thoughtfulness, in many situations most, if not all, the DC needs can be met in this fashion. And if they are not, at a minimum half should be covered, leaving a long period of quiet with the 2000 amp hour battery bank taking up the slack. A couple of final points: first is the question of glare impacting people on the upper deck. We are told that the combination of matte finish and dark cells designed to absorb solar energy rather than radiate it makes glare a minor issue, probably less of a problem than glare off the sea surface. In addition, the combination of a sloped array, and seat backs in front should help in this regard. Secondly: maintenance appears to be minimal in terms of cleaning dirt off the panels. In areas with occasional rain, that is apparently sufficient to keep them clean. Accumulated salt spray will require removal, which means walking on the panels. Bob Williams says that although the manufacturers say not to walk on the panels, it is common practice as long as a piece of plywood is used to spread the foot load to the panel edges. Here are a couple of solar simulations (from dozens of models) to give you an idea of how the shading works. This set is with the boat in the Carolinas (USA) in June, initially oriented East/West. The time of day and/or sun position can be seen to the left. Now switching orientation 45 degrees to SE/NW. DC System: House and starting batteries, cable runs, switch panels, battery switches, heavy duty breakers, fusing, 12V power supplies. AC System: Generator, high load inverters, low load inverters, nav inverters, isolation transformer, switch panel, shore power connections. Heating: Boiler and exhaust, plumbing runs, fan coils, thermostats. Air conditioning: Compressor placement, ducts including return air, thermostats, pump placement, plumbing from pumps, condensation drainage. Miscellaneous Plumbing: Damage control, domestic water, sewage (black and gray) holding tanks, water-maker, hydraulics. Although we have been through this many times, if we know we’ll be working with a specific builder, we get them involved in these preliminary decisions. 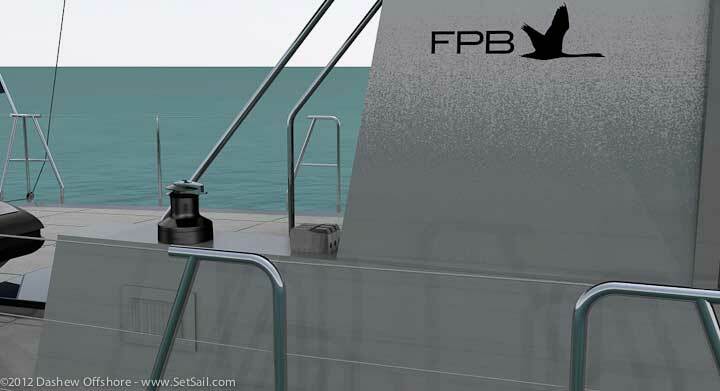 With the FPB 97, allowance has been made within the structural system, between hull plate and interior liners, to pull the vast majority of the plumbing and wiring through the structural frames. And throughout the interior design process we are continually asking where all this gear is going to fit. If there is one the key to a positive ownership experience it is systems space. If there is enough then the boat is easier to maintain, and you are more likely to catch problems early. The basement on the previous FPBs have worked well in this regard. With the FPB 97s we have opted for a systems room between the accomodations and engine space. This area houses batteries, inverters, control panels, black boxes, fridge compressors, and some air conditioning gear. Not only does this afford excellent access, but this space provides a substantial sound barrier between the engine room bulkhead and guest suites. The entire engine room bulkhead, nearly six meters/20 feet across, is devoted to systems installations. This means that most shooting and maintenance is going to take place out in the open. Of course there is more going on here than just systems. 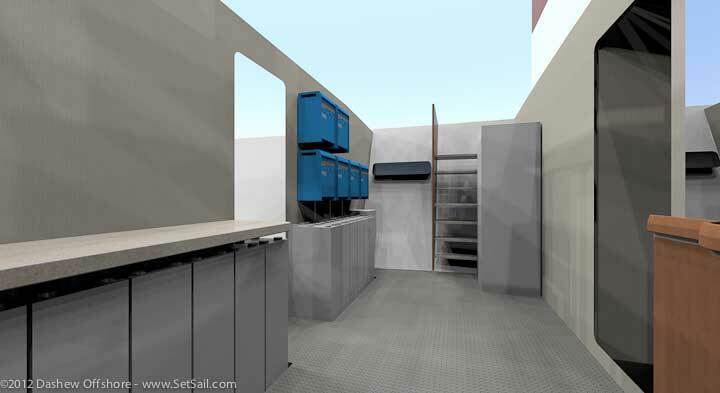 There is a day head, an extra fridge/freezer unit (30 cubic feet/800 liters), a laundry with washer/dryer, ironing table, and shelves, and loads of bulk storage. And there is also room for crew, if needed (and those bunks make great storage racks). But the key is the bulkhead and the room it affords. This will be covered in detail at a later date. One of the nice things about this concept is that the Matrix deck, with all its electronics, is directly above. The many cables and plumbing headed that way have a clean run from here via either of the masts, which are also directly above. 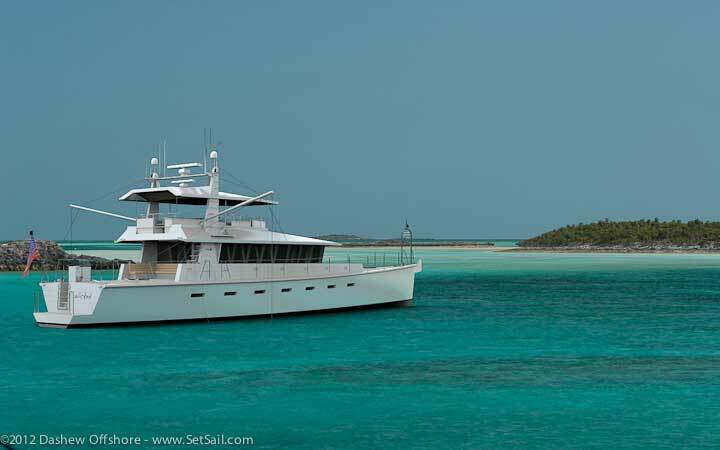 All yachts require bulk storage for ship’s equipment used, stores, emergency gear, and toys. There is rarely enough volume, which results in a jumble, with what you really need usually at the bottom of the pile. We’ve always factored in the bulk storage areas from the beginning, and then made them off limits–except for systems–to interior intrusion. Our forepeaks and basements are prime examples of this rule. With the FPB 97 the systems room will, in many cases, see much use in this regard, if crew are not in residence. If you just used the starboard side space, bunks, area outboard of the head, and near batteries, you could store 40 or more duffel bags. But the piéce de resistance with regard to storage is the forepeak. We’ve mentioned it in a structural context already. Now let’s look at the volume. These frames are 1.1 meters/43″ apart. The image is looking aft from the area immediately aft of the self-draining chain locker. There is a substantial “bilge” below the floorboards shown in the image below. 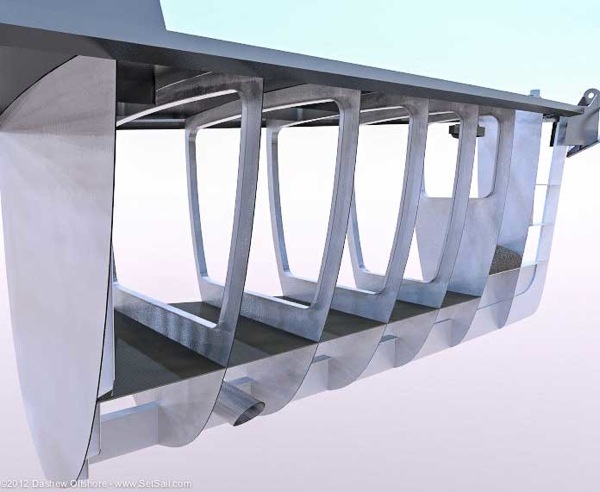 Because of the hull rocker (curvature), the entire bilge drains aft to the bulkhead. If you store items forward of the aft section, they will stay dry. The bulk of the area is over three feet/90cm deep. There is enough volume here to store spare docklines, anchors, shore fast reels, extra fenders (deflated), and a host of other items. This leaves the huge area above the floorboards for everyday gear- heavy and light dock lines, eight fenders, oars, skis, gale rider, para anchor, and various long rodes. All of the above will fit within the first three frames aft of the anchor chain locker, using less than half the volume in this section. There will be a series of horizontal elements to neatly secure various items. This leaves more than 60% of total volume left over. A waste? Hardly. You can neatly store deck furniture, cushions, bikes, spare outboards, a vast array of diving gear, the list is limited only by your imagination. The further you venture off the beaten path, the more valuable this space becomes. And you have the room to store things neatly, easily accessible, properly secured and protected. This volume holds one of the secrets to making the FPB 97 work for its owner: offering a level of freedom that only comes when you have the ability to carry the right gear. Of course there are other areas of bulk storage scattered through the interior. But we assume these are employed for the supplies required for day-to-day living. Dinghy storage and handling is another one of the baseline items that must be integrated into the design from the beginning. Our assumption is that two dinghies will be carried. We want them to be launched and retrieved with little fuss and absolute reliability. The FPB boom system is the first step in this direction providing for excellent control in adverse situations. The booms have fixed topping lifts and pre-rigged control guys, lead through rope clutches at each mast base (shown above), which are simple to use (without the complexity and concomitant maintenance issues of mechanical cranes/davits). The advent of sheet winches which power in and out has made this system even easier to use. 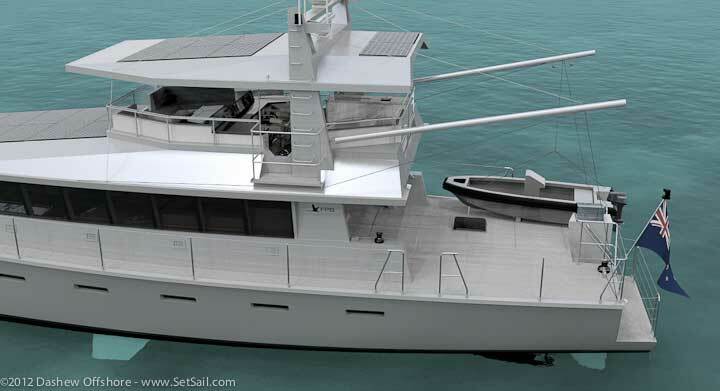 The dinghy shown in these renderings is a Circa fifteen-footer. There is room for two large dinghies and a smaller rowing skip, should the need arise. We have a detailed post on the launch/retrieval process here. The bottom line in all of this is a rig which makes the retrieval process so easy there is no hesitation bringing the dinghy back on deck, and reduces the risks associated therewith should it be necessary in a rolling anchorage. We have left the interior part of the design cycle for last, as we believe we have to first understand how the preceding subjects manifest themselves in a new design package. The basics of the interior are, of course, in the design cycle early. But this is in the form of blocking out certain volumes we know are going to be needed. We don’t get into the details until the latter stages of the initial go-around. There is often tension between what works at sea and what looks best at anchor. The norm is for the latter to prevail–it sells boats to the uninitiated at boat shows. But if you end up crawling around on your hands and knees in the first good gale, or sleeping wedged in between sofas on the salon floor because your bunks don’t work in at sea, the enjoyment of being at sea will quickly fade. 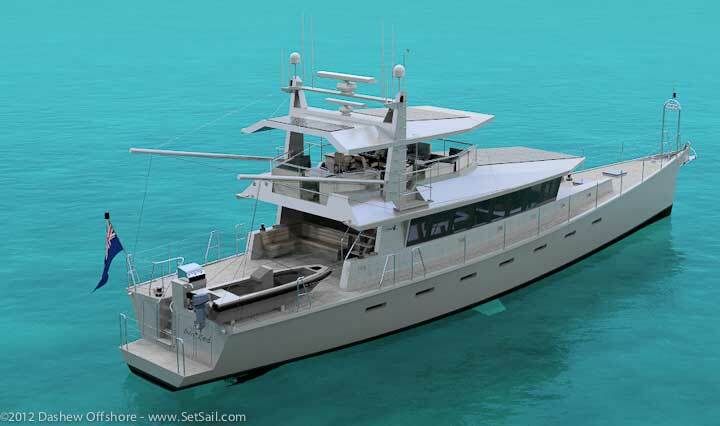 We always orient our designs for offshore comfort first. We’ll be taking a look at the interior shortly. We promise you will find the wait worthwhile. This entry was posted on Saturday, February 18th, 2012 at 8:32 pm and is filed under Dashew Logs, Wicked FPB 97. Both comments and pings are currently closed. What I see there is just following logic for offshore vessel, your vessel design logic, from Beowulf to Windhorse, the FPB64, FPB112-115 as project, and now the FPB 97 and his raised great room who permit new development for technical room size and position. Strange how Everclear and Solar panel can open to design who is finally more near Windhorse that the previous FPB 115, isn’t it? 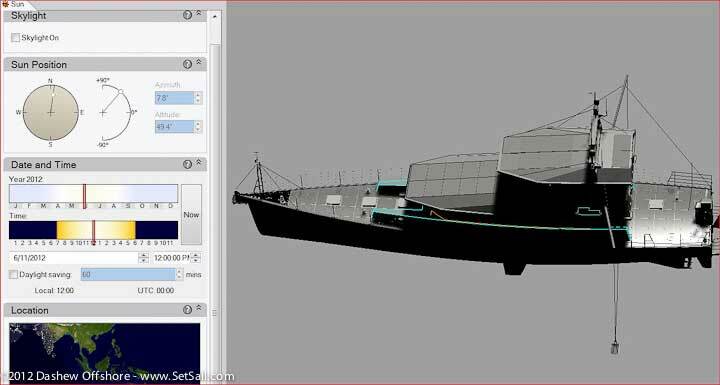 Would it be possible to add the Wicked hull to the hull scale graphic depiction shown on the 115 site in order to understand how the 97’s hull size and form compares to the others? Perhaps when we get caught up. It struck me in the section about bulk storage, that getting supplies into the forepeak might be a problem, at least for heavy or bulky items. 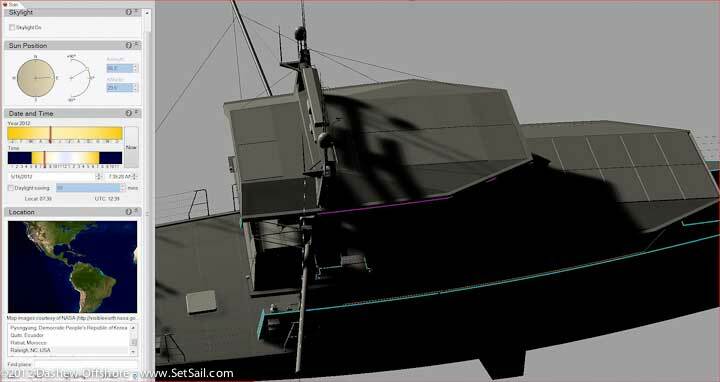 How difficult would it be to add a davit of some sort that would allow allow items to be picked up from the dock, and loaded through the front hatch? Say something like a pallet of bulk goods like canned food for instance, or spools of line? There is a simple, demountable, job boom system for heavy items in the forepeak.